Are you struggling with marketing reports? Do you feel like you’re wasting way too much time creating reports? Are you confident you're reporting on the correct KPIs and metrics? We hear you. Even here at IMPACT, we've been inconsistent and inefficient with our marketing data -- but that all changed in 2017. We used to scramble to collect data via HubSpot, Google Analytics, Salesforce, Facebook Ads, Search Console, etc. but struggled to actually put that data into use quickly and efficiently. Now, what used to take us hours and days is streamlined into a clear, concise, and repeatable process. And we’re going to share this with you. Sound good? 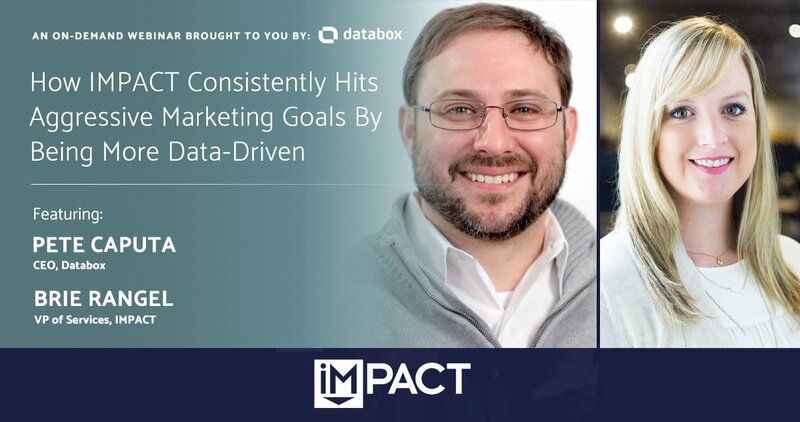 In this 60-minute webinar, Databox CEO, Pete Caputa and IMPACT’s Director of Client Services, Brie Rangel, dive into how IMPACT saved time and hockey-sticked our (and our clients') performance through data aggregation and real-time reporting. We’ve done the heavy lifting and figured reporting out, and we share exactly how we did it all! Then, we walk you through Databox’s analytics aggregation, automated S.M.A.R.T goal tracking, and custom dashboards so you can be ready to flip the way you handle reports in 2018 into a breeze instead of a chore. Pete has worked with 100s of businesses directly as well as helped 100s of agencies and media companies grow by helping their clients achieve predictable, measurable and improvable ROI from the marketing and advertising services they provide. As the CEO at Databox, Pete is currently 100% focused on helping marketing agencies automate their reporting. As the Director of Client Services at IMPACT, Brie oversees the agency teams including Principle Strategists, Strategists, Designers and Developers. Brie currently works remotely from her home in Houston, Texas. When she’s not cheering for the Astros, using the word, “ya’ll” in every sentence, you’ll find her hanging out with her family and her bloodhound, Duke. Want just the webinar slides? Fill out the form, and you'll gain access to the slides from the webinar!